Fall has been creeping in, and this week at my house it fell with a soft thud. Glorious cool days have arrived, some rainy and some not. They are giving way to even cooler nights. The sunlight has changed directions coming in through the trees and the days have shortened noticeably. These short daylight hours are just what are needed to get Christmas Cactus ready to bloom again. Leave them outdoors as long as you can but be sure to get them indoors before the first frost. In order for Christmas Cactus to set buds, they need short days, cool evenings, and a bit of dry weather. If your climate tends to heavy rains in the fall, then the cacti should be sheltered and only watered occasionally. A screened porch is a perfect spot to get them ready for their display. The shortening days will trigger bud set. When frost threatens, place them into a cool, unused room with plenty of daylight (but no artificial night-lights) until the buds start to open. Then move them to a prominent spot where you and your holiday guests can enjoy their display. When you bring them into the main living area, be sure to change your watering schedule. Once blossoming begins, these cacti need to have slightly damp soil all the time. Good light and even moisture keeps them from dropping their buds and blooms prematurely. One warning: Do not let them set in water. This can cause root rot. When the cacti quit blooming, cut back on the watering again and let them rest. Christmas Cacti do best in a cool, sunny room but keep them out of direct sun. Mist them once each day to keep the humidity high around the leaves. Next spring, after the threat of frost, repot them with fresh soil, and set them outdoors in partial shade. These cacti and/or their offspring have been known to live long enough to be passed down from one generation to the next. You can easily start them from stem sections. Often, you will even see dry roots hanging from the joints. Just bury a joint and watch it grow. 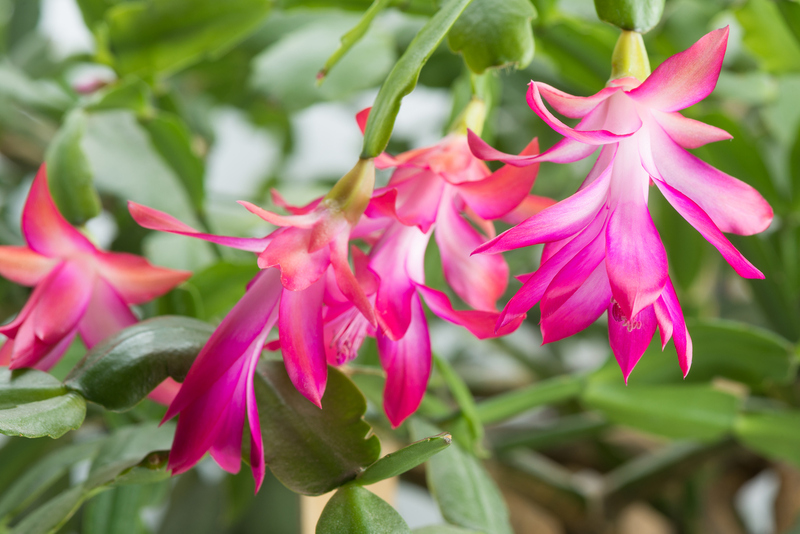 If you give the Christmas Cactus a modest amount of care, it brings you oversize rewards.